After almost five months in Australia we did an amazing discovery. 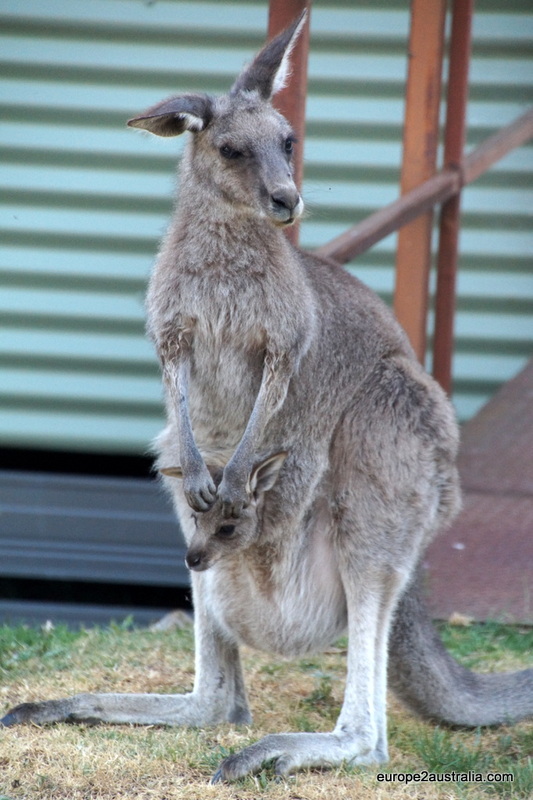 Kangaroo’s are not a marketing trick, they actually exist in the wild! Although the first one that we encountered was a ‘dead’ one on the side of the road. At that point we were still thinking that it was a stuffed one, put there by the marketing people, just to make you believe in it. 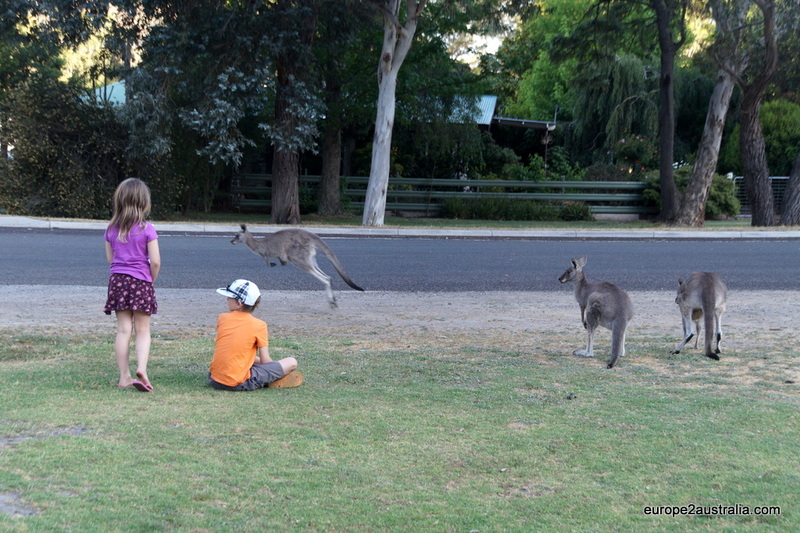 However, when the sun started to set, the camp ground at Hall’s Gap where we were camping in the Grampians suddenly turned into a playground for many kangaroo’s. They are not very shy, you can get up really close to them. Just touching they do not allow. 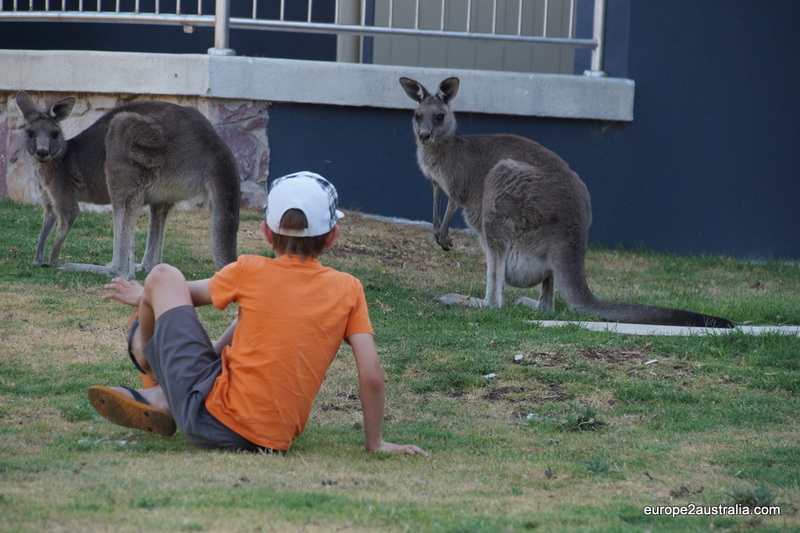 Kai communicates with the Kangaroo. From then on we saw them everywhere: on the playground, at the side of the road and on the camp site. While we were sitting behind our tent on the camp site a kangaroo just came hopping by. The camp spaces are not very big here, there was not even a meter between our tent and the neighbouring one, but the kangaroo decided that that was the best place to cross. This all happened really quickly, I had my back towards the side and by the time Oliver stumbled on his words he had already passed. I could only see it hopping over the street. Their hopping makes a very distinctive sound, which you easily recognise after you have heard it once. Unfortunately there is no picture proof of this. So we managed to tick off another one of our 38 things we want to do in Australia. Kangaroo with Joe. The Joe’s stay with their mother for quite a while. No wonder, if this is the way you get treated…. Previous Post Sydney… or London? Supergaaf! Wij hebben net ook de eerste wilde ‘Roos’ gezien hier in de bush. Heel speciaal! Wat ontzettend gaaf! Hebben jullie deze kangoeroes nu bij jullie in de buurt gezien of waren jullie verder weg aan het kamperen. Ging het goed met kamperen? En heb je al enig idee wat het volgende item is dat jullie van de lijst kunnen strepen? We waren aan het kamperen in de Grampians, hier 3 uur vandaan. Ik ben al bezig met de volgende post hierover. Volgt asap. Tsja, het volgende item, we laten ons verrassen.